This range is available as a modular concept. Make 2000, 3000 or 4500 litres per day, details upon request. The FuelMaker is a range of professional equipment designed with business and safety in mind. This is the ideal tool to allow you to take control of your fuel costs. 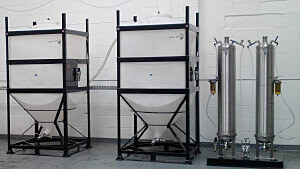 This unique processing system removes the need to handle dry caustic soda – the use of liquid Methylate allows accurate dosing of catalyst previously only available to industrial scale operations. The fuel is washed and purified through our specially designed columns containing the industry standard dry ion exchange resin, for which a compressor is required.